My father and I used to go to the movies together. I am thinking about the time when I was nine and we saw The Pink Panther Strikes Again. I am thinking about the antics of Peter Sellers as the French detective Clouseau and of his ambushing major domo Cato, played by the actor Burt Kwouk. Pure hilarity ensued each and every time the bungling Chief Inspector returned to his Parisian apartment. Bedecked in a tweed trilby hat and trench coat, the mustachioed Clouseau would enter his flat en garde, stalking the seemingly empty rooms poised for battle with an unseen foe. When at last Cato sprang from the shadows, a veritable tsunami of destruction followed as the two men wrestled for primacy. Bookcases and chandeliers fell. Porcelain teacups crashed and shattered. Their combat moved from room to room, overturning china cabinets, snapping tables in half. In slow-motion action, a bed frame crumpled under the weight of the mock-pugilists, now poised like lovers on top of another. Then, at the height of this pitch-perfect bedlam, with uncanny comedic timing, Clouseau’s telephone rang. All pandemonium ceased. On screen, swirling plaster streamers—the aftermath of pitched battle—fell from the ceiling like snow. Clouseau stood and collected himself. He pulled his silk robe straight, smoothed over his rubble-laden hair in an attempt to restore dignity, and searched for the ringing phone in the fallout of his once pristine bachelor pad. As he picked up the receiver, its fuse-like cord dangling into the debris, Clouseau snapped his heels and popped to attention. This was the movie’s call to action. And Clouseau, in a voice brimming with exaggerated confidence and a buttery French accent, accepted it. But before the scene shifted, in a climactic masterstroke of comedic genius, the incompetent but charmed detective took a final swat—a death-blow sucker punch—at the unsuspecting Cato, rendering the hapless servant unconscious or worse. This ritualistic gag between Clouseau and Cato never failed to satisfy. It never failed to elicit anything short of guffawing appreciation from my father and me. In no small way, the film oriented my relationship with my father, a tunneling of inside jokes based on the shared experience of watching a movie together. Those tunnels remain open to this day, shored up like a vast catacomb of oft-quoted lines resurrected again and again across time and distance. Thomas Wolfe, the lyrical and lanky Southern author, once wrote of seeking “the great, forgotten language, the lost lane-end into heaven.” For my father and me, the movies, especially comedies, offered up a private language—an argot of quips, bawdy put-downs and one-liners—which provided us a flickering glimpse into Wolfe’s paradise. Whatever threadbare conversation we’ve sustained over the years, so much of it has been held together by the patchwork of the movies we once watched. We have recycled laughter and eschewed life’s complex realities in favor of roustabouts’ banter. “Which of us has looked into his father’s heart?” Wolfe asks in Look Homeward Angel. “Which of us has not remained forever prison-pent? Which of us is not forever a stranger and alone?” How much easier it is to dwell in laughter than to ponder such questions. In my mind, it was a Saturday, at the start of those glorious two weeks of winter vacation. The theater sat at the intersection of Southbridge Street and Main Street in downtown Worcester. Constructed in 1904, in the very infancy of moving pictures, the building first opened as a performing arts center in the already decaying heart of the once vibrant mill town. In 1967, two years before I was born, the theater became a Cineplex. For the next thirty years, it showed movies on the silver screen before closing and falling into disrepair, only to be remodeled and reopened as a performance theater again in the last few years. I might have held my father’s hand as we walked through the lobby that day. Surely we stopped for popcorn and Cokes at the snack bar. Stepping inside the cinema’s massive interior, lined with ornate plaster work and red-velour carpets—hints of a more formal past—it felt like the opening act of a dream. I remember the balcony seats and brass railings, the way the air smelled of butter and boot soles, licorice and lemonade. I remember feeling contained by the place, enveloped by its grand ceiling, its massive chandelier which dimmed as the giant screen slowly emerged from behind the parting ceiling-to-floor red curtains. It was unlike any movie theater I’ve ever seen since. In his short story “Behind the Blue Curtain,” Steven Millhauser describes the near-holy ritual of a boy going to see a movie with his father. “On Saturday afternoons in summer my father took me to the movies. All morning long I waited for him to come down from his study, frowning at the bowl of his pipe and slapping the stairs with his slipper-moccasins, as though the glossy dark bowl, the slippers, the waiting itself were a necessary part of my long-drawn-out passage into the realm of the dark.” Though my memory is wintry, and though my father wore Converse instead of moccasins, and smoked cigars instead of a pipe, Millhauser perfectly captures a young boy’s fascination. The occult memories of such a day linger, a spectacle right up there with trips to Fenway Park and Christmas Eve Mass. That December day, my father told me we were going to visit a priest after the movie. Even then, this struck me as odd. Dad wasn’t a churchgoer. He attended only under pressure, usually from my mother. The original Christmas Catholic, he never spoke about his beliefs. On those rare, rafter-shaking occasions when I saw him in the pews, he looked uncomfortable there, acting in a role he wasn’t meant to play. Why on earth would he be taking me to visit a priest? After the movie, we emerged from the dark theater to a world transformed. A thick blanket of snow had fallen in the two hours since we entered. White powder covered gray sidewalks and swirled in the air. If there is a more purely magical event in life than that of a sudden snowstorm, I’ve yet to find it. We walked along Worcester’s busy Main Street and the movie echoed in my head. Clouseau had again defied the odds, defeated arch criminals and laser death rays. He emerged the hero, riding a wave of dumb luck and opportunistic incompetence. His certainty buoyed me as we headed toward the rectory at St. Paul’s Cathedral, as though my life too could be organized along these lines, with laughter, bon temps and predictable outcomes. It was only a short walk from the theater’s lobby, a block down Main then left on the now-snowy Chatham Street to the cathedral. A layer of snow coated the ground. Steam rose from grates on the street. From a nearby restaurant came the thick smell of frying food, a carnival smell, a delicious odor somewhere between fresh donuts and golden French fries. It made your mouth water, made you want to rush inside and order everything on whatever menu promised such delight. Life seemed, in that blissful moment, archetypically divine. Dad and I crossed the street, stepping though slush trails from passing cars, and reached the gate of the rectory at St. Paul’s. I must have been thinking of Christmas presents. I must’ve been anticipating the bounty of two weeks off from the trenches of fourth grade. The snow had coated everything by then, an inch at least, maybe more. The snow fell as big flakes and varnished the ground in a heavenly white. That warm, greasy-spoon smell was so strong that my stomach roiled with anticipation. Then, just before my father rang the rectory doorbell, I saw something that has stayed with me for almost thirty years. A man was in the alley adjacent to and behind the movie theater. The man’s dark clothes were tattered and layered thick. Everything about his face looked strange somehow, like Clouseau in the wrong costume, his disguise gone grotesquely awry. The man’s hair was wild, long and filthy. The exposed parts of his skin—his face, his fingers, the back of his neck—flushed red from the cold. Snow dusted his shoulders. He stood hunched over, perhaps sheltering himself from the cold, or perhaps the posture was just a result of life on the streets. I watched him for a while, standing next to my father who saw him too. We were waiting for the priest to buzz us into the rectory. The man moved between one trash can and another, always carefully replacing the lids as he went and bowing, almost as if in prayer. It seemed such an oddly polite gesture, almost gentle. What was he doing? The realization seemed to come slowly, but the entire moment couldn’t have lasted more than a few seconds. The man’s soiled hands were rummaging through trash cans. Lifting the silver lids and diving in, he pulled out food wrappers and placed them to his mouth. He was eating the trash. The diffuse, savory air suddenly went sour in my stomach. I wanted to run. I wanted to run away from everything, from my father, from the rectory we were about to enter, from the snowy Worcester streets and from this abject misery. I wanted to run, but I couldn’t move. It was as though I’d been ambushed. As though something sinister had jumped out of the shadows and knocked me down. I wasn’t prepared for it. I hadn’t entered this scene the way Clouseau would have, en garde, ready for the attack. I wasn’t engaged in mock-battle with my faithful manservant. I wasn’t play-fighting on a mirthful stage. It was as though the script had been rewritten, the farce between Clouseau and Cato had suddenly turned, as though their combat had turned deadly and their play-violence had become macabre. It was as though Clouseau was thrust onto the scene of an actual crime and his incompetence revealed. In a single flash, the laughter stopped. There would never be a one-liner to make this image go away. In front of me was a man eating trash. It pierced my soul. Of course I felt none of this then. I felt only a tug, the merest pinprick of sorrow and pity that could just as easily have passed and been forgotten. How could the boy I was that snowy day know that he would carry this feeling for the rest of his life? The rectory door opened and we stepped inside. The man eating trash disappeared. As I think back on this day, I wonder if it was real. I wonder if the events really happened the way I’ve reconstructed it. I want to ask my father about it. I want to ask him if he remembers the movie, if he remembers the man on the street. I want to ask him why we went to visit a priest that day thirty-five years ago. My father laughs. He has been drinking. I hear the way his words seem to lean in his voice, as if they are holding on to some invisible rail, about to stumble off the edge of a cliff. I can tell within the first eight seconds of any conversation with my father how much he’s had to drink. “How did you know him, Dad?” I ask. I’m careful not to delve into the real questions, into why in the world we would have gone to the cathedral that day when my father never went to church. There is something bumbling about my father’s memory, made maudlin by years of hard-drinking and the ravages of time. I only remember going to the rectory that one time, though my dad speaks of it as if it was yesterday. The narrative of his memory often doesn’t match my own but the salience of those experiences remains undiminished. He tells me that Father Mahan was killed in a car wreck a while back, but we don’t dwell for long in these somber places. We never do. My dad laughs, but his laughter suffuses with sadness. “He was such a nice man,” my father says again. His voice drifts. Rather than digging deeper, rather than pressing about the priest, rather than asking him about the man I saw that day, I steer the conversation back to our script. I won’t allow my father’s boozy sadness to leach into my own loneliness. These are long-standing rules. I realize, somewhat reluctantly, that I am as much responsible for maintaining them as he is. I’m not going to ask him about the man in the alley. I’m not going to reveal myself to my father. Instead, I return to what has sustained us. “Does your dog bite?” I say, quoting Clouseau. “That is not my dog,” my father says in perfect Clouseau echolalia. We’ve got a million of ‘em. Inside, the rectory was warm and bright. Amidst crucifixes and grim oil paintings of saints and countless depictions of Christ’s all-too familiar suffering, Father Mahan shook my hand and smiled at me. I remember him being a big man, with red hair and a ruddy face. We stayed longer than felt comfortable. I want to say that my dad and the priest shared a beer, but I don’t remember. I doubt they spoke of spiritual matters. My father was certainly not one to open up, especially not to a priest. How such a triangle ever existed—my faithless father, that Irish priest and the homeless man—remains an utter mystery to me. The day re-forms as but the thinnest shell around a glimpse of a vast and unknowing emptiness. There is a haunted divide between what I feel and what I know. Then, like now, I must have wanted to ask my father about what I’d seen. I must have wanted to ask the priest. I must have wanted one of those men to put a context on what I’d witnessed, to frame it for me, in a way that reassembled my cracked world. Surely these men knew. Surely they could offer an explanation. If only I had asked. But I was terrified of giving voice to what I felt. I was probably terrified of even feeling it. On the phone, I don’t ask my father about the man eating trash. I don’t ask him why he visited the priest that day. It seems enough to share the simpler memories, of the movie, of a few lines, though sometimes I wonder what would happen if I could step past my doubt and fear. My failure has always been silence. I feel that deeply. Decades have passed. Peter Sellers has died and The Pink Panther has been remade with Steve Martin. Father Mahan is dead. 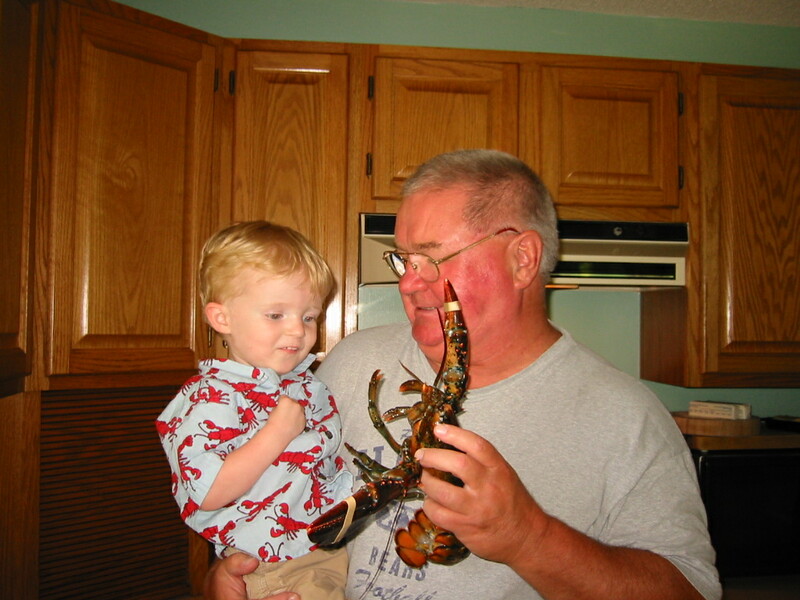 My father survived a bout of cancer and heart surgery and has begun to encounter the rocky shoals of an old age. I, too, am a father now, constructing memories with my own kids, wondering what they will take away into their lives. Almost certainly that man rummaging through the garbage cans has died. Almost certainly he is buried in some Potter’s field, or perhaps, on a more hopeful note, he was reclaimed by family, a lost son brought home, and, at last, restored to some dignity in death. Comedy is festooned with deep truths. We laugh, often to avoid crying. 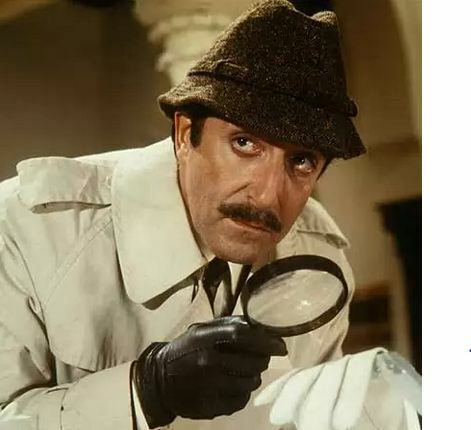 We pepper our consciousness with simple-minded heroes like Chief Inspector Clouseau in order to shut out the grimmer realities of what wanders along at the margins of our lives. It is one way of coping. My father and I forged a deep bond that day at the movies. We acquired vocabulary for the common language which we continue to speak. Though the gaps between us have widened, the connections remain strong, sustained by revisiting the various films we once watched together. The movies revealed a world at once marvelous and impossible, ridiculous and haunted. In time, as it must, the sublime slapstick gave way to more harrowing realities. The laughter from those memories remains a less lyrical though no-less vital descendant of Wolfe’s homeward looking angel. We are only offered glimpses into the mystery, flickering frames viewed from the balcony of an old theater, but they have to suffice. Soon, the final credits will roll, the lights will come up and it will be time to go. But for now, we enjoy the laughter. Richard Farrell is the Creative Non-Fiction Editor at upstreet and a Senior Editor at Numéro Cinq (in fact, he is one of the original group who helped found the site). A graduate of the U.S. 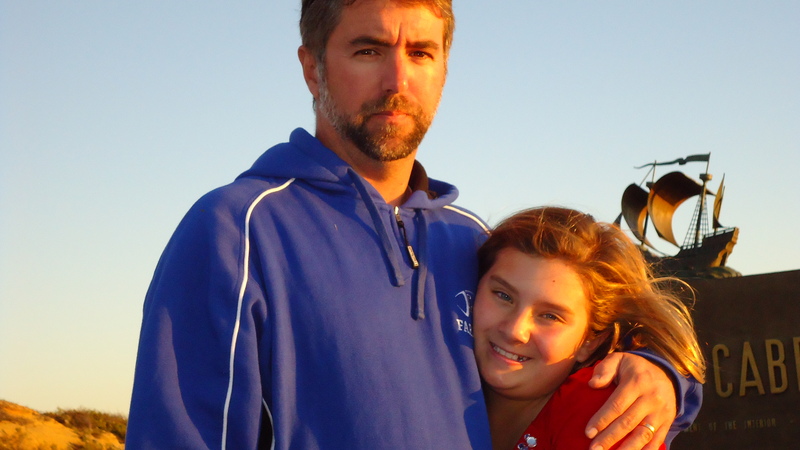 Naval Academy, he has worked as a high school teacher, a defense contractor, and as a Navy pilot. 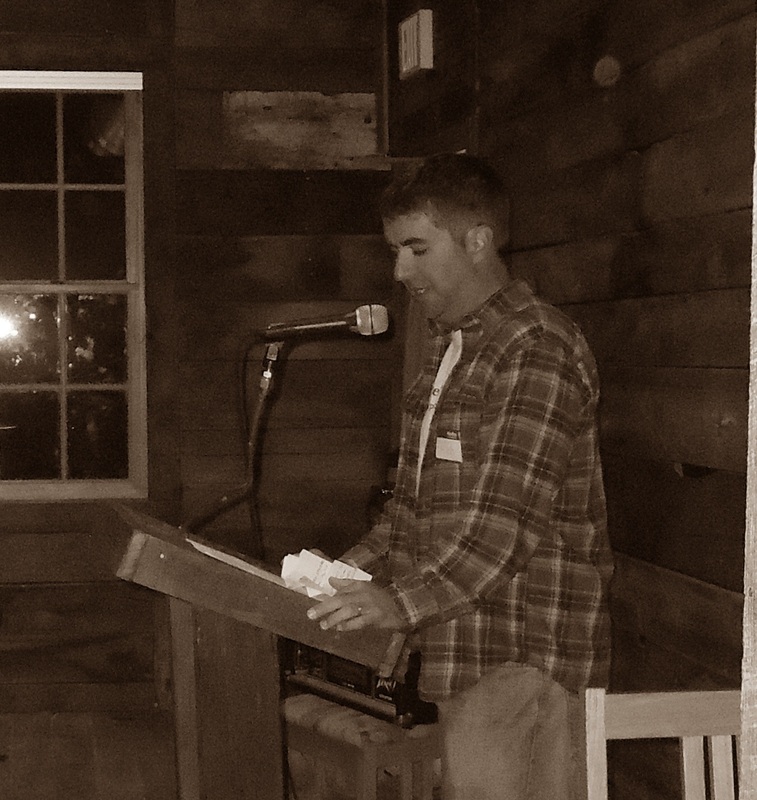 He is a graduate from the MFA in Writing Program at Vermont College of Fine Arts. He is currently at work on a collection of short stories. His work, including fiction, memoir, craft essays, and book reviews, has been published at Hunger Mountain, Numéro Cinq, and A Year in Ink anthology. His essay “Accidental Pugilism” (which first appeared on Numéro Cinq in a slightly different form) has been nominated for a Pushcart Prize. He lives in San Diego with his wife and children. Perfectly captured the essence of our father in this essay Rich. And, you cleared up a giant mystery for me about how you two have always conversed! Your writing…whew, it’s so exact. Well done! Ah, Jen…what can I say? Gorgeous writing! “Those tunnels remain open to this day, shored up like a vast catacomb of oft-quoted lines resurrected again and again across time and distance.” It reminded me of how we all pretend to some extent, we all play games to get by, get through it all with some meaningful connection, even when we know it’s a game. Such an admirable blend of honesty and compassion. Lovely, lovely essay. Wow!!! To be able to express your very heart in such eloquent words…..I have to say….I’m so impressed! This essay was a window into your soul that I never expected.